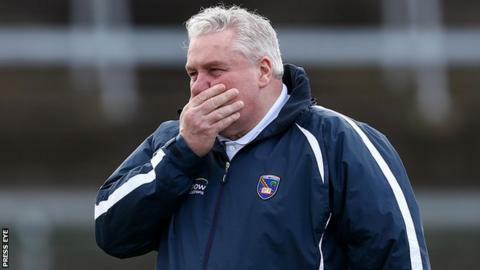 Donegal secured their expected return to Division 1 of the Football League with a win at the Athletic Grounds that sent Armagh crashing to Division 3. Jim McGuinness's side led 0-4 to 0-2 when Michael Murphy netted a penalty after a foul on Colm McFadden. Jamie Clarke responded with 1-1 to cut Donegal's lead to 1-5 to 1-3 by half-time but Murphy's second goal after the restart put the visitors in control. Sub Paddy McBrearty's four second-half points helped Donegal stay in front. The win means Donegal will face also-promoted Monaghan in the Division 2 decider in three weeks. Despite playing against the breeze in the first half, Donegal notched the first four points with McFadden and Rory Kavanagh both stroking over two efforts. Crossmaglen man Kyle Carragher and Aaron Kernan got Armagh scoring only for Murphy to net his 15th-minute penalty after Finian Moriarty had hauled down McFadden. But Clarke responded with 1-1 for Armagh to leave the minimum between the teams with the Crossmaglen star poking in his goal from close range after good work by Kevin Dyas. Donegal led 1-5 to 1-3 at the break and after Tony Kernan had cut the advantage again to a single point, Murphy scored his and his team's second goal after fielding a long ball from Kavanagh, who had grasped a Paul Durcan kick-out. A couple of more scores from Tony Kernan cut Donegal's lead to three but McBrearty's arrival helped the 2012 All-Ireland champions pull clear in the closing stages. and in the process, consign Paul Grimley's Orchard men to Division 3. Four weeks ago, Armagh had looked more likely to be challenging from promotion to Division 1 than battling relegation after an impressive away win at Navan had been followed by a victory over Laois. But Armagh's campaign seemed then to be totally unhinged by the home defeat by Ulster champions Monaghan which was followed by their reverses against Galway and Donegal. A Down victory against Laois on Sunday would have kept Armagh in Division 1 but the home side earned a 1-16 to 2-10 victory over the Mourne men at O'Moore Park.